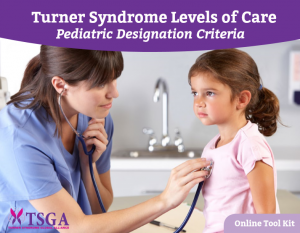 TSGA has developed the TS Levels of Care Pediatric Designation Criteria. These levels will be used to inform the patient and family population of the level of care they can expect from each Clinic. 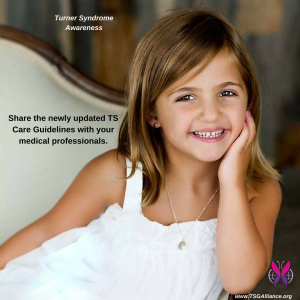 If your hospital has a Turner syndrome program, and you would like to be included on the TSGA list of providers, please complete the Clinic Designation Survey. After two years of dedicated work by a team of experts from both the US and Europe, the new Care Guidelines for TS have been finalized. TSGA is proud to have been a primary sponsor of this project. These guidelines are directed by evidence-based research. We are now working with the greater TS community to increase research to fill in gaps in our knowledge. 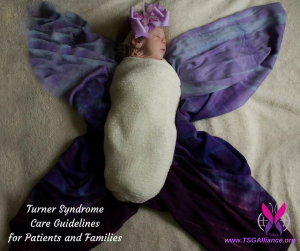 This is a brief synopsis of the Professional Care Guidelines intended to improve care by encouraging communication between individuals with Turner syndrome/parents/caregivers and their health-care providers during visits. A = consistent, good-quality patient-oriented evidence; B = inconsistent or limited-quality patient-oriented evidence; C = consensus, disease-oriented evidence, usual practice, expert opinion, or case series. For information about the SORT evidence rating system, see page 323 or http://www.aafp.org/afpsort.xml.